Sleeperdorm v Newcastle upon Tyne, Anglie: Zarezervujte nyní! Groups will not have individual shares in any rooms. Code of conduct form is required to be completed by the group leader on arrival. Sleeperdorm is modern and well situated for anyone visiting Newcastle. The building is newly refurbished and close enough to Town, but just that little bit out to avoid all the hustle and bustle. Everyone at Sleeperdorm is here to ensure that you have an enjoyable stay. Sleeperdorm is located in the West of the City, approximately a 15/20 minute walk to the City Centre and 10/15 minutes to Central Station. Located just off Westgate Road, famous for its motorbike stores. Only a short walk into town or the train station. There is a vast selection of Bars, Restaurants, Nightclubs, Theatres and shops to keep you busy. Close to St James Park, home to Newcastle Unites. Gateshead Metro Centre is only 4 miles away. 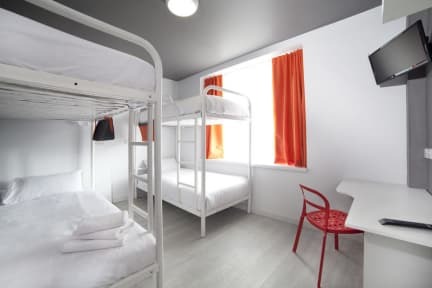 Sleeperdorm has 12 bedrooms over 3 floors, comprising Twin, Double, Bunk bed rooms. All 12 rooms are en suite with toilet, washbasin and power shower. The hotel offers Free Wi-Fi throughout and also a TV lounge with Smart TV and computer. We also have a kitchen area and microwave for guests use, sandwiches, tea and coffee and Breakfast to Go are available from our vending machines. We have available to hire Hairdryers, Hair Straighteners, iron and ironing boards for hire. There is a smoking shelter and bike storage available on site. Continental Breakfast not included - 6.00 GBP per person per day. Anyone under the age of 18 and I.D will be requested. Must be accompanied with an adult.